Under the Compact, the Upper Basin States are obligated to deliver 7.5 million acre feet (maf) of water downstream to the thirsty Lower Basin states. Unfortunately, this requirement was derived from faulty baseline data as the rainfall patterns that occurred in the years prior were abnormally high and the flows were vastly overestimated. Delivery of this amount of water will be further impacted by warming climate projections that indicate that the region will become drier in the long-term, and we may be in an era of steadily declining river flows along the Colorado. To make matters worse, demand in all of the basin states like Colorado are increasing as populations in the area continue to grow, further stressing the already over-allocated river. These devastating impacts are evident in the water storage levels within the river’s two largest reservoirs, Lake Powell and Lake Mead, which are measured in order to determine if the Compact obligations are being met. Recently the reservoir levels have dropped to their lowest levels since 1937 and have shrunk to less than half their capacity. Until now, the system has worked, but if the Upper Basin states fail to deliver the mandatory volume of water to the reservoirs then the Lower Basin states could make a “Compact call” forcing the Upper Basin to curtail use of post-1922 water rights from the Colorado. That means Colorado’s growing population, amidst a warming and drier climate, will be forced to use less water so Lower Basin states can receive their legally obligated share. To address diminishing flows and greater demand for the water, agricultural producers in Colorado’s west slope are participating in a voluntary pilot program that compensates them for temporarily fallowing their crops and letting the water run down the river. In 2014, facing declining levels in lakes Mead and Powell, the Upper Colorado River Commission (UCRC), the Bureau of Reclamation and four water providers piloted a program in the Upper Basin to test water conservation strategies that could be part of a drought contingency plan. 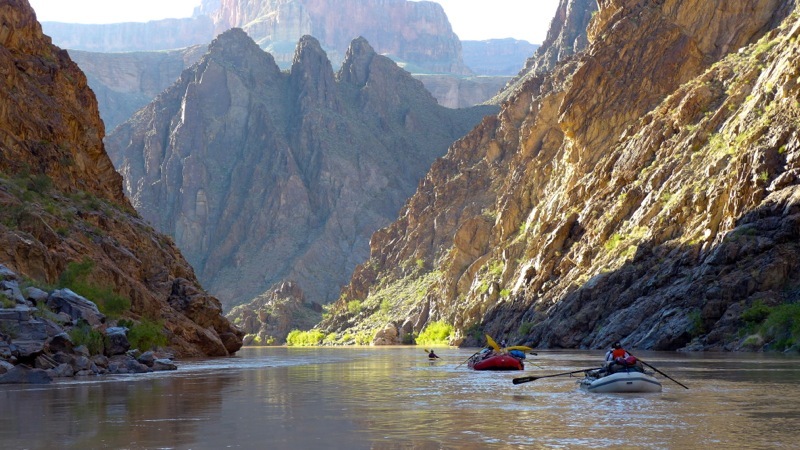 The goal of the Colorado River System Conservation Pilot Program (SCPP) was to demonstrate the viability of proactive, cooperative and voluntary compensated means to reduce the risk of reaching critical reservoir levels needed to protect the Compact entitlements. The program allows farmer and ranchers to voluntarily and temporarily let water run down the river and forego the use of their water to irrigate fields in exchange for compensation. The SCPP also reduces “buy and dry” scenarios where struggling farmers are bought out so developers can have access to their water for neighborhoods or transfer their water to municipalities. A shining example is the 9,177-acre Porcupine Ridge Ranch in Routt County, Colorado and the latest to take advantage of the UCRC’s program by voluntarily reducing consumptive use of its water rights and fallowing 1,941 acres of their irrigated hay fields, or nearly twenty percent of their ranch. In exchange, the ranch will receive up to $421,650, in addition to the current cattle and hunting leases that remain operative alongside the water fallowing. This is one of the largest awards given to a single property in Colorado and outlines a model of what’s to come, if ranchers and farmers take advantage of the opportunity while they can. As the Compact nears its 100th birthday, policymakers and landowners alike need to take an honest and accurate view at rainfall rates amidst a warming and migrating population to rebalance water needs and who gets what (and why.) The SCPP is a start in the right direction as it addresses water supply shortages and provides a possible hedge against potential future Compact calls. It also benefits agricultural producers by creating a potential income source by funding voluntary conservation measures while also avoiding buy and dry measures that separate their water from the land.